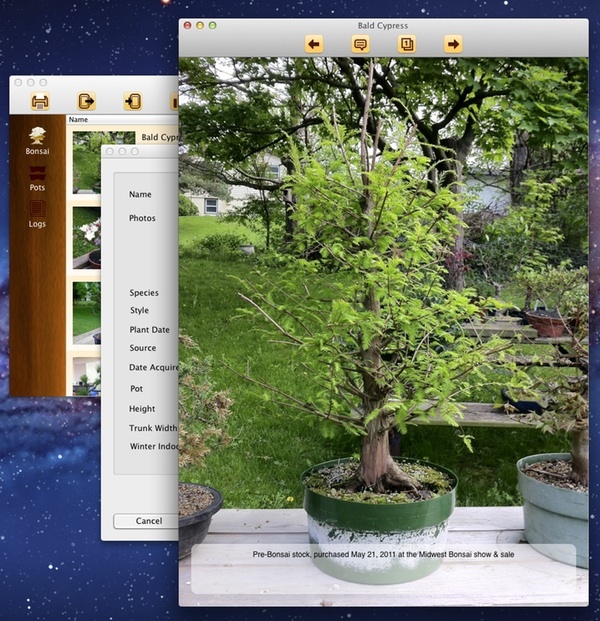 Track your Bonsai tree collection on your Mac – Coming Soon! If you’re into bonsai and you have an iPhone, iPad, or iPod touch, you’re probably familiar with my bonsai app, Bonsai Album. Last year I announced I’d begun work on a Mac version, and I posted an early preview screenshot. Since last year I’ve been busily working on the app, and now it’s almost feature-complete! The Mac version includes some additional features over and above the iOS version, like photo organization, printing, enhanced search capabilities, and support for Mac Retina displays. You’ll also be able to transfer data between the Mac and iOS versions over WiFi. The screenshot above shows the captioned photo display feature, similar to the iOS version. The app is currently being localized into multiple languages, including English, Japanese, French, Italian, German, Spanish, and Portuguese. All of these languages will be supported at launch. Bonsai Album for Mac will be available for purchase directly via my website, as well as through the Mac App Store. There’ll also be a free trial version available for download, with similar limitations to the iOS Lite version. I’m still working on a release date, but I anticipate it should be ready sometime in March, 2013. Beta-testing will commence shortly. If Bonsai Album for Mac sounds interesting, you might want to sign up to the mailing list below to be notified about the Beta-test and app launch. I can’t wait to bring this exciting new app to bonsai fans around the world! This entry was posted on February 10, 2013, 8:37 pm and is filed under apps, bonsai. You can follow any responses to this entry through RSS 2.0. Both comments and pings are currently closed.